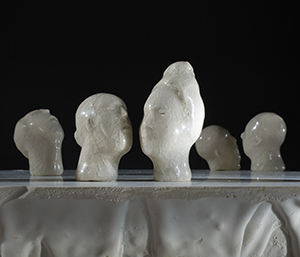 Small porcelain heads rise from the surface of a smooth white plaster plane. Beneath this glassy sheet, rough forms flow menacingly. The figures, covered with a crackled glaze, appear as fossils caught in a last gesture. Eyes closed or averted, they seem absorbed in an intense private melancholy, their fragmented bodies lost to memory. The shell, the castoff home of water creatures, is commonly used in kitschy seaside souvenirs. This well-tread ground finds an illuminated beginning as the surface of each unique shell interior renders multiple variations of spheres. 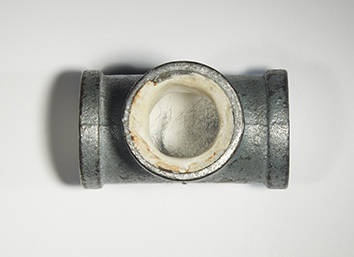 The hand-held object becomes a visual metaphor for the infinite space of the universe. 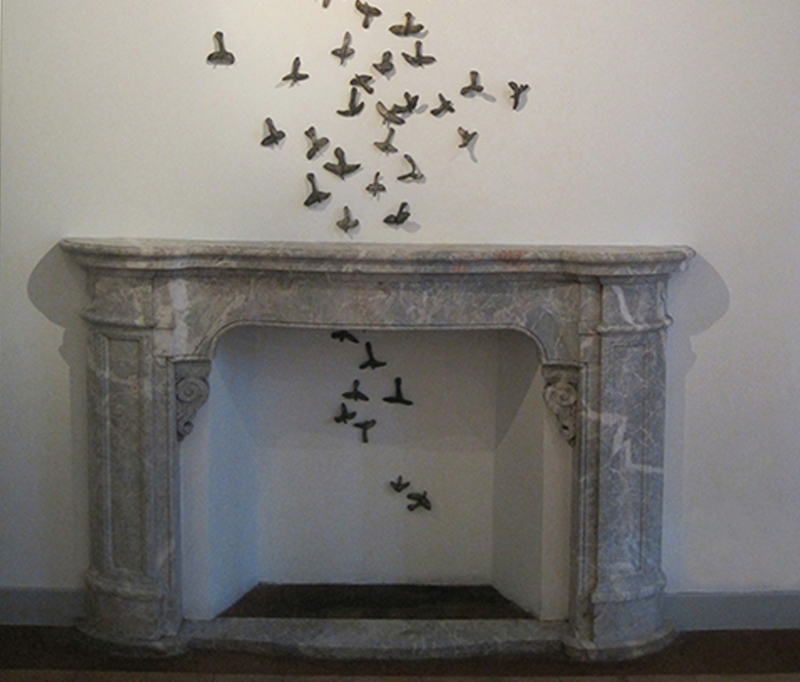 Small bird-like forms swarm a marble fireplace, providing a fleeting glimpse of an accidental intrusion of wild birds caught within a domestic space. The birds fly across a wall and fade into the light. This vast and nearly invisible wildlife surrounds a presumed stability. 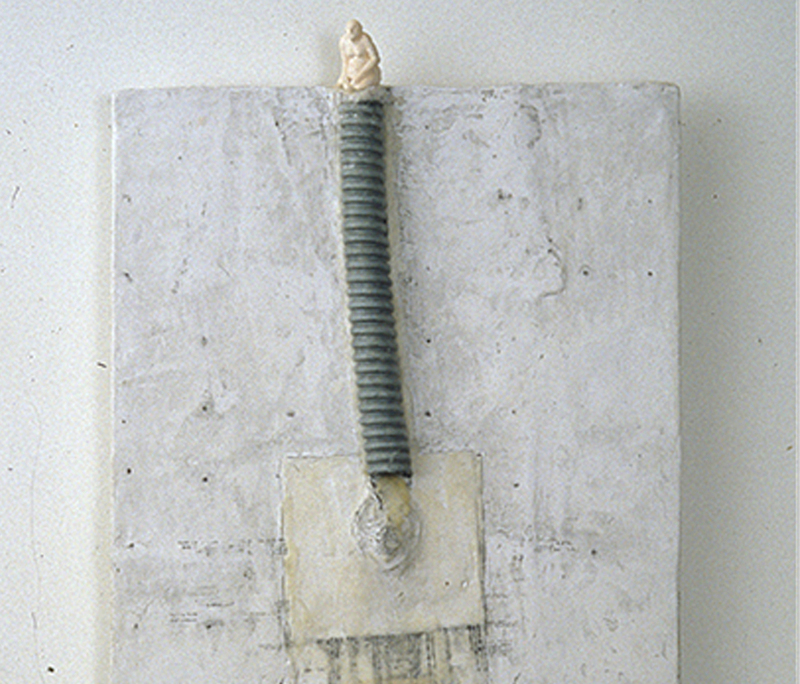 The relief sculptures contain small sculptures, drawings and miscellaneous objects layered within the wax and plaster. They reference the tokens, marks and memories that a home accumulates and that can be lost to time and forgetfulness. A single putto drawn in graphite falls through space pursuing an object of desire in this series of soft-edged, irregular shaped rectangular plaster panels. The putto, a chubby naked baby boy, has been a motif in art since classical times as Cupid or Eros. Unabashed, they give their bodies free play.